It is not clear to us exactly where the people in the reading are. We are told that Lazarus “was carried away by angels to the bosom of Abraham.” However, Abraham died a long time ago and, as far as we know, went to Sheol, the place of the dead, like everyone else who died. The rich man is in Sheol, but he is experiencing great sufferings, which was not the usual description of that place. We know that he is not in hell, because we see him worrying about his five brothers, whereas hell is a place of complete selfishness. Perhaps they are all (Abraham, Lazarus, and the rich man) in Sheol, but Abraham and Lazarus are in the part where they are waiting for Jesus to come and take them to heaven after he dies, while the rich man is in the part for people who will go to hell. In that case, things are only going to get worse for the rich man. If we would go to hell for being rich, we here are all in trouble. All, except the very poorest people in our country, live a life more luxurious than the rich man. True, we do not have servants, but our food is more sumptuous and our clothes are more impressive. However, Abraham too was a rich man, and he is not suffering. Perhaps we would say that the problem is that the rich man never helped Lazarus. Abraham, however, does not draw the rich man’s attention to this failure, nor to the disrespectful way that the rich man is still treating Lazarus. He calls him “my child” and asks him to remember the difference between the life of Lazarus and his life. The problem seems to be that the rich man never suffered. Perhaps the rich man was in the section of Sheol for those who would go to heaven when Jesus came and got them, but who needed to suffer first, similar to what purgatory is now. Before any sinner can go to heaven, they need to suffer for their sins, even after being forgiven. Some people suffer in this life; some people suffer in the next. We should take our suffering in this life and avoid it later. Hours spent on our knees in prayer or days of fasting or serving others who we could avoid all sound better than the torments that the rich man was experiencing. Jesus always knew what was going on. He was not caught up in events beyond his control. Even before he went to Jerusalem, he not only prophesied his death and resurrection, but even described how it would all take place. When we hear the story of his passion in a few weeks, we must keep today’s Gospel in mind. Jesus did what he did on purpose. Nothing could have been done to him if he had not allowed it to happen. There is nothing he suffered that he did not choose to suffer. This does not take away the guilt of those who betrayed him and condemned him and scourged him and mocked him and crucified him; they also chose to do what they were doing. Jesus, however, must be seen throughout all this as one who came “to give his life”, not someone who had it taken from him. What does it mean for Jesus “to give his life as a ransom for many”? A ransom is the price paid to a captor for the freedom of the captives. Who is our captor? Satan. Sin. Death. We sold ourselves into captivity for a fruit. We were meant to be free. We were supposed to be kings and queens of this earth. Instead, we have spent the majority of human history in captivity. Satan demanded the life of an innocent man for ransom, and Jesus paid it with his own life. Only he could pay it, because he was the only innocent man. His life could not be taken from him, but he could lay it down. What Satan did not know was that, having laid it down, he could take it up again. The ransom has been paid, so Satan is forced to release us, if we will be free. Jesus unlocked the door of the dungeon that is sin, but we have to choose to walk out. This should not be difficult, the choice to leave sin behind, but we are enamored with the little comforts that we have found in this filthy prison cell. We must somehow work up the courage to leave! How foolish we look, choosing to stay in the dark, dirty prison, rather than go out into the light. We hear voices, whispering, enticing us to stay. We are frightened of what “going out” means. So we stay, in sin, ransomed prisoners who will not leave. “Call no one on earth your father; you have but one Father in heaven.” It seems at first glance that we are guilty of letting a human tradition stand in the way of the words of our Lord. It seems that way at second glance too. We cannot say that Jesus was wrong, and we cannot say that Matthew did not faithfully hand on what Jesus Christ really taught. There are some little tricks that people use to explain this, but they are not satisfactory. True, we call our male parent, “Father”, but Jesus is talking about titles that religious people take on. True, we do not use the exact word that Jesus condemns, since he did not speak English (the word “father” had not even been invented yet), but this seems too legalistic. Jesus is saying that we should not call anyone by the same name that we use for our male parent, no matter what language. True, Jesus says “call no one on earth your father”, and we do not call anyone “Our Father” except God, but why do we come so close to breaking the command? However, and this is a big however, the use of “Father” as a title for religious leaders goes back as far as the Church herself. 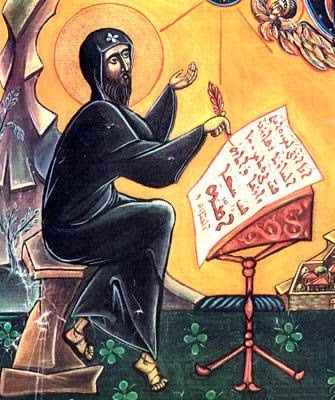 The desert monks of the early Church were called “Abba”. St. Paul himself says that “For though you have countless guides in Christ, you do not have many fathers. For I became your father in Christ Jesus through the gospel.” We did not just discover the Gospel of Matthew yesterday. Even St. Jerome, 1600 years ago, struggled to interpret this verse in light of the tradition. It seems strange that this tradition grew up in a Church which always read the Gospels. The people who first started calling a priest or a monk “father” knew what Jesus had said. In fairy tales, not the Disney versions but the originals, a common trope is that the king will ask the wicked person for advice on how to punish a wicked person. The wicked person misunderstands who the punishment is for and advises a particularly horrific punishment. Then the king tells the wicked person that they will be punished exactly as they said. There is some poetic justice in how the person is forced to suffer their own sentence. I often wondered why they never realize in time that they have been caught and suggests some very light punishment. Jesus warns us that we are going to suffer this poetic justice. Hopefully, we hear his words in time to save ourselves. If our King asks me how a sinner should be treated, I am going to say that he should be forgiven if he is even a little bit sorry and then welcomed into heaven. These cannot be mere words: I need to start treating sinners that way since that is how I want to be treated. Jesus tells us that the measure with which we measure will be measured out to us. In other words, we should do unto others as we would have them do unto us, because that is in fact how it will be done unto us. So it is that we are very good about making up excuses for ourselves. We should stop that. But, at the very least, we should start using this marvelous talent with other people. Not pretending that bad is good, but making every excuse for the person who has sinned against us. When someone cuts you off in traffic, presume that they are on their way to the hospital. When someone snaps at you, presume they have a very bad headache. When we measure out punishment, what seems like a tiny dose given to another will look enormous when it is directed back at ourselves. So when Jesus says, “Be perfect”, what does he mean? I suppose he could mean, “be really not so bad after all” or “accept your imperfections as part of who you are”, but I actually think he meant “Be perfect.” My difficulty is that I fail utterly at being perfect, so what then? The command to be perfect stands on its own. Even if I am not perfect and have not been perfect and have no reasonable expectation of achieving perfection in the future, I am still commanded to be perfect. The command never goes away. The Pharisees loved to know the limits of commands, where they could stop obeying, but this command is unlimited. Some psychologists would say that this is unhealthy obsession with perfection, that I should learn to love myself just the way I am, but I cannot. I want to love myself just the way I could be. On the other hand, Jesus might mean this not so much as a command as an offer. These sorts of phrases are always in advertisements. You know: “Live in Florida” or “Be beautiful.” The advertisement is saying, “It is possible to do these things if you take advantage of what I am offering you.” Then Jesus’ words would mean that if we love our neighbor and our enemy, we will become perfect. Love has the power to perfect us. I know that I will never be as perfect as my heavenly Father is perfect. No matter how perfect I ever become by the grace of God, God will be more perfect. Jesus does not compare our perfection to our Father’s perfection because that is reasonable goal for us, but because we should look at our Father who loves us and want to be just like him. God made the rocks to be rocks and the flowers to be flower, and God made the angels to be angels, but he made humans to be gods, sons and daughters of the Most High. Today we celebrate a very interesting feast: the Chair of St. Peter. This feast is not exactly in honor of a person, as most are, nor of an event, as others are, but of a chair. Of course we are not commemorating a piece of furniture today; the chair in question is “chair” like “chairman”, a position, an office. We celebrate today the founding of the position of the leader of the Church. Jesus Christ is the head of the Church; this office in no way replaces his office of high priest and king. God did not need Noah to build the ark, and he did not need Simon Peter to lead the Church. He chose to allow us humans positions of dignity as cooperators of his grace. When Simon made the profession, “You are the Christ, the Son of the living God”, Jesus explains “Flesh and blood has not revealed this to you, but my heavenly Father.” Because of this revelation, Jesus renames him Kephas, which in Greek is Petros. This was not a name; it means “The Rock”. Jesus then says “upon this rock I will build my Church.” Which rock? Not Simon Peter the man, who would deny Jesus three times. Jesus founds his Church upon an idea: the idea that God reveals the truth to a human being. Jesus is hereby instituting an office, the Chair, and choosing Simon for that office which will be the foundation rock of the Church. Along with the position comes certain powers: “I will give you the keys to the Kingdom of heaven. Whatever you bind on earth shall be bound in heaven; and whatever you loose on earth shall be loosed in heaven.” This language is the traditional language for a king to install a prime minister, a leader to serve under the king and do the day to day work of the kingdom. Jesus makes a promise to Peter and therefore to the Church: “Upon this rock I will build my Church, and the gates of the netherworld shall not prevail against it.” This promise is often misunderstood. It is often treated as if it meant that the Church would be able to withstand any attack by evil, but this is backwards. He says that the “gates”, the defenses of Hell, will not be able to stand against the Church. It is the Church who is attacking evil, and we will be victorious. The condition that Jesus sets today for receiving the gifts of God is asking. Ask and it will be given to you. God gives good things to those who ask. Why do we have to ask? The desire has to precede the gift. If we receive a gift that we do not want, we thank the giver politely and then put it on a shelf. The gifts of God are not made for shelves. God is not holding back a gift until we ask for it nicely. His hands are forever extended, ready to give, but he will not shove the gift down our throats. Jesus speaks of a gift today, not wages. We cannot earn the gift of God, otherwise it would not be a gift. This does not mean, however, that we have nothing to do. We have to prepare ourselves for the gift. If we bought a dress for a woman, not in her size but in the size that she ought to be, she would not be able to receive the gift until she had gotten into shape. This sounds rather offensive and mean-spirited, and so it would be coming from a normal giver, but God has all kinds of gifts for us that will not fit us now. He is anticipating what we can become, not what we are. When St. Francis prayed that God would show his love, he received the stigmata, the wounds of Christ in his hands and feet. If he had received that gift before his conversion or too soon afterward, it would only have confused him and either increased his pride or discouraged him altogether. Imagine the gifts that God has planned for you that will not fit now. These are not gifts for you alone, but for the whole Church: gifts of healing and prophecy, gifts of suffering and martyrdom, gifts of faith, hope, and love. We should celebrate whenever we see spiritual progress, wherever we see it. Not only will the praise of God be greater, but we are closer, as a Church, to the next gift. There are amazing gifts just around the next bend, if we will make progress. We stand here, playing with mere toys, afraid to take the next step. We need to start seeking and finding the next foothold in our spiritual life. Our progress, which is measured in love of God and neighbor, is so little, so far. No one is beyond the forgiveness of God: not the people of Nineveh who, 3000 years later are still remembered as being particularly cruel, nor King David who killed a trusted soldier in order to cover up the affair with his wife. God will not spurn a humble, contrite heart. There is no sin which God will not forgive. The sins we have committed are not preventing us from being saved, but our defense of sin is. God wants to forgive us, but we hide our sins. No one can hide their sins except from themself. All our sins are being done in full sight of heaven and hell. God wants to forgive us, but we have excuses for why we committed the sin. God wants to forgive us, but we say that what we did is not a sin. God wants to forgive us, but we would rather pretend that we do not need forgiveness. God is infinitely good. The smallest sin we ever committed is, therefore, an infinite offense. If we understood the enormity of God’s love for us, we would understand why there can never be a small sin. No matter what we have done, whether or not we would be judged by the world as very bad people, we need hearts contrite and humbled. How will our hardened hearts become contrite, humble hearts? Only God’s grace can do this, but we accept this grace when we repent. Repenting means confessing our sin and committing to never do it again. We are in constant need of repentance because we are constantly failing. We must repent today and every day until we die. The alternative is to accept sin into our life, to stop fighting against evil, to compromise our soul; the alternative is a heart impenitent and proud. Heaven is full of prostitutes and murderers and drug dealers and thieves and adulterers; the saints, with only one exception, were all sinners with contrite, humble hearts. When we are before the judgment seat of God, we will not need to defend our sins. Indeed, we must not try to defend the indefensible. It will not matter on that day how many sins we committed or what they were. Only our accuser will be concerned with that. It will only matter whether we repented of them all. We are guilty; our only hope is forgiveness. Our God is not deaf. He is not asleep. He is not far away from us. Our God is not busy. We have so much difficulty imagining an omnipotent, omnipresent, omniscient, eternal God that we invent difficulties that do not exist. We imagine that God must be too busy running the whole universe to listen to us. God is not like us. He is more attentive to each of us than we are to ourselves. He knows the life history of every mosquito. He knows when a hair falls off our head. We cannot fathom how attentive he is to us. God does not hear us because we pray to him. He hears every word we speak all day long; he knows every thought we think. We may be tempted to imagine that when we turn to God in prayer, it is like picking up the phone and calling him. Not at all! We are more like a toddler picking up a toy phone and calling our father who is sitting right there watching us. God does not hear us better when we are in church or when our hands are folded or when we are looking up at a particular corner of the ceiling or shouting at the sky. God is not inattentive, but we are. The difference between when we pray and when we are not praying is not God’s attention to us but our attention to God. Sometimes we wonder whether God is hearing our prayer. This is certain: he is. Our real concern should be with whether we are hearing him. God is with us always, hearing every thought, feeling, and word, but, when we finally turn to him, we act like he does not know us. We think that prayer is all about God, but, paradoxically, it is all about us. When we pray, we are not contending with an absent God but with ourselves: with our selfish, stubborn, obtuse natures. When we pray, we may use many words or few, we might repeat a prayer or speak freely to God, we may invoke God’s name or ask a Saint to pray for us, we might read the Scriptures or sit in silence hoping to hear the Spirit speak within us, but we should not pile up words, as the Gentiles do, thinking that in their many words they will be heard. We are not trying to be heard; we are trying to hear. When it comes to saving for retirement, all the financial advisors agree: save early and save often. It would seem that the point of working is to produce a retirement account. As for your IRA or 401K, I cannot say, but for the most important retirement account we have, this advice stands. We have an account in heaven. The interest rate is phenomenal, and the market is never going to crash. There is a kingdom there that has been prepared for us from before the foundation of the world. There is a room there with your name on it, waiting for you to move in. We need to build up that account though; we need to start making deposits. God’s bank tellers are all around us: the hungry, the thirsty, the naked, strangers, the imprisoned, the sick. Whatever we deposit with them is going to be credited to our account. The Church sets before us the fourteen works of mercy. The seven corporal works and the seven spiritual works. The seven corporal works include the six that Jesus mentions here and, because groups of seven are kind of the thing, adds burying the dead. A good practice this Lent would be to make sure that we do something for all seven. Feed the hungry, whether in person in a soup kitchen or by sending money in the rice bowl or donating to the food shelf. Give drink to the thirsty. Clothe the naked, and not only with your cast-off clothing that you wanted to get rid of anyway. Visit those in prison. Welcome the stranger, particularly the homeless, perhaps not into your own home, depending on your circumstances, but into a home. Visit the sick, especially the forgotten people in nursing homes. And bury the dead, come to a funeral, especially of someone who would not have had many people come. Do these works of mercy generously, not as if only trying to check off a list. Do these works of mercy gladly, not only because people need your help, but because you need to be merciful. Do these works of mercy unreservedly, without too much concern for the worthiness of the recipient: be willing to be taken advantage of. When we arrive at the day of judgment, we do not want to be shocked by how low the balance is in our account. Start saving up now; make regular deposits. Save early and save often. We never know how much longer we have until an accounting will be taken. In the first reading, God, speaking through the prophet Isaiah, tells Israel the proper understanding of the Sabbath. The point of the Sabbath is not so much to rest as to, for one day, do the work of God instead of our own work. God tells his people to “honor it by not following your ways, seeking your own interests, or speaking with malice.” This is also a good description of what Lent should be about. The true spirit of Lent, fasting, almsgiving, and prayer, is embodied in this idea of turning our back on our own interests. Of course, most people will still have to work during Lent at a job which serves their own interest. Not everyone can take 40 days of vacation to serve the poor. Still, just because a person cannot do something entirely does not mean they ought not do it partially. We would all greatly benefit if, for the next 40 days we all stopped following our own pursuits and began serving. How easy it is to follow our own pursuits! Even many who claim to follow God only follow him after serving themselves. Jesus said to Levi, “Follow me.” How easy it would have been for Levi to have cleaned up his work and collected all the money sitting out on the table, first taking care of Levi’s priorities before getting around to Jesus, but, instead of telling Jesus to wait just a minute, without a thought for anything in front of him, “leaving everything behind, he got up and followed him.” The miracle recorded today is that Levi forgot. Levi forgot about the work he was doing. He forgot about the money he had collected. He forgot about whoever was next in line at the customs post. He forgot about his own interest and followed Jesus. Again, not everyone can drop what they are doing to follow Jesus. Not everyone, but some can. Could you, like Levi, forget everything, leave it all behind and follow Jesus? Perhaps, like the rich young man, you would need to sell everything, close up shop, and then follow Jesus. Perhaps you are already where you belong, and what is left is to wake up every day and follow Jesus by doing your work with great love. The main thing is to follow Jesus, completely abandoned to his will, not doing what seems good in our own mind but having the mind of Christ. The Gospel today reminds us of the special experience of the disciples of Jesus. They did not need to fast because he was there. If they wanted to pray, they could just go find Jesus and sit at his feet and listen to the words he spoke. In the Gospels, Jesus only appears to us when he is saying or doing something of great importance, but the disciples lived with him every day. They ate dinner with him. They slept wherever he was sleeping. The fact that the disciples did not fast teaches us about fasting. Fasting is supposed to create a longing within us. This longing is always present, but we usually answer it with food or television or other diversions. This longing is a longing for God. We only answer it with lesser things because it is difficult to know God in this world, but, if God were present as Jesus was present to his disciples, we would never eat when we were not hungry, we would never zone out with television. If a hungry man cannot get food, perhaps he will chew on bark or something else to pass the time, but, when he has food, he will throw away the bark and begin to eat. So we also, when we get to heaven and live in the presence of God, will throw away whatever we have used to quiet our longing for God. Here and now it is painful to throw these things away, since it is easier to eat a bag of potato chips than to pray for an hour. Still, we force ourselves to fast so that we do not forget what we really want, so that we do not forget what the longing is really for. As we fast this Lent and rediscover our longing for God, we must be careful to not find a substitute for what we have given up. Particularly if you have given up television or the internet, you may find that you have literally hours of extra time each day. Now is not the time to become an avid reader of novels. Use the time for the other Lenten practices: prayer and almsgiving. Help those in need. Read the Scriptures. Spend some time in Adoration. If our fast is the kind of fast that God loves, it will turn us outward to God and to our neighbor. “If anyone wishes to come after me….” How gently does our Savior invite us! Who can hear this offer and refuse? “If anyone wishes to come after me….” I do. What do I need to do? “…they must deny themself and take up their cross daily and follow me.” Here is that Lenten trio again: fasting, almsgiving, and prayer. “They must deny themself” We do this through fasting, not only from food but also from all of the pacifiers we use to quiet our souls’ longing for God: entertainment and comfort and other pleasures. When we deny ourselves we experience a kind of suffering, but this suffering can be very addictive; it is actually joy. “Take up their cross daily” Sometimes, when people talk about this verse, they speak of our cross as our suffering. Anything from arthritis to disabilities to other people can be called a cross. This is a half-truth. The central mystery of the cross is not that Jesus suffered and died, but that he suffered and died for us. A cross is not whatever difficulties we have in life. Everyone has difficulties. We take up the daily cross when we embrace suffering in order to assist another, either directly or by offering some suffering to God for them. Indeed any suffering we experience in life can be a cross, but only if we embrace it and offer it. We are most conformed to the cross when the work we do for others is the source of our suffering. Agreeing to help someone we dislike can be a way of the cross; from beginning to end we may be suffering physically or mentally or with wounded pride. Take up such crosses daily. “Follow me” To follow someone simply means to be with them, wherever they go. Our way of being with God is prayer. Prayer is a conversation we have with God, and, like any good conversation, includes both speaking and listening. As we converse with God, chains will bind our heart to him. Then, no matter where the world goes, we will stay close to him. Prayer, fasting, and almsgiving can seem cold and theoretical. Jesus is inviting us, in a personal way, to take up these essential spiritual practices. Above all, he is drawing our attention to the fact that he himself has taken them up already. In our Lenten journey, when it is difficult, we should remember that we are coming after Jesus, who has made this journey ahead of us. “The last temptation is the greatest treason: To do the right deed for the wrong reason.” This quote from T.S. Eliot comes in a play where a saint is tempted by many things but does not give in, and then the final temptation arrives: “To do the right deed for the wrong reason.” If Satan could convince us to not fast at all this Lent, he would. If not, he will try to get us to fast in a silly way, to give up chocolate chip cookies for Lent, as we eat brownies instead, or, perhaps, we obey the abstinence from meat on Fridays by having a feast of shrimp and lobster. If we are not taken in by any of this, the last temptation comes: “to do the right deed for the wrong reason.” We fast, in order to impress people. We fast, in order to lose weight. We fast, in order to fulfill some New Year’s resolution. Jesus told us to love God above all things and to love our neighbors as ourselves. Love is the heart of Christianity, but our love is weak and disordered. We do not love God with all our heart and soul and strength, so we need to spend time in prayer this Lent. We do not love our neighbors who are created by God, our brothers and sisters, so we need to give away that which we love more than them, our money and our time. We do love ourselves, but we love ourselves in the wrong way; we should love ourselves like parents, with some discipline, having our best interest at heart, but, instead, we love ourselves like senile grandparents, over-indulging ourselves with candies and toys, so we need to start refusing ourselves treats sometimes. Prayer, fasting, and almsgiving are good for us. They should hurt. Our souls complain about being unselfish. Do not give in to the complaints! Our souls warn us that this is too much, too much prayer, fasting, and almsgiving; it will kill us: without selfish indulgence, we will die. Good! Let us die. Let us be nailed to the Cross with our Savior. Then, when Easter comes, he can raise us up. Our souls are flabby and out of shape. The combined effect of all the sins we commit is puny, scrawny, pathetic souls. We are in serious need of spiritual exercise: prayer, fasting, and almsgiving. If we make feeble attempts, we will get feeble results. It is 44 days from now until we celebrate the Easter Triduum, we get 4 days of introduction and then, on Sunday, the 40 days of Lent begin. The lazier we are, spiritually, the rest of the year, the more seriously we should look to these days as a time of intensive effort, P40X for the soul. If we are going to make this intensive effort, we had better be sure that we are doing it for the right reason. If we fast and tell people about our fasting, if we give to the poor our money or our time and make certain that the world is aware of our generosity, if we pray so that others will see us, all that effort will be wasted. Only our pride will be strengthened; our souls will be weakened further. Let us pray until we fall head-over-heels in love with God. Let us give away our money and time until we begin to love our neighbors as ourselves. Let us fast until our love for ourselves is no longer self-indulgent. When we look out and see the canyon between us and heaven, we want to move forward, we want to take the leap of faith, but we are afraid, afraid of many things, but especially frightened that we will begin to live a new life and soon fail and be laughed at for ever trying. Lent is our training ground, our opportunity to try out the life of the Saints. If we cannot be perfect all year-round, let us be perfect for forty days straight. The theme of the readings today is “struggle”. To struggle is to fight, specifically to fight against a force preventing you from moving toward your goal. Without a goal there cannot be a struggle. We see a woman trying to touch Jesus’ cloak, and there is a crowd in her way. We see a man trying to help his daughter, and in his way are several people who are telling him that that his effort is useless. We hear in the reading from Hebrews an exhortation to all Christians to run the race despite the sin clinging to us. What an interesting point: “In your struggle against sin you have not yet resisted to the point of shedding blood.” There is such a difference between the way that a person struggles and the way that a desperate person struggles. Of course, desperate is exactly the wrong word but conveys the right image. Desperate means “without hope”, but a person without hope does not struggle at all. What I mean by a desperate person is someone who has nothing except hope. The woman who needed healing did not stand on the sidelines and vaguely wish that she could touch Jesus’ cloak; some pushing and shoving went on. When the people came up to Jairus and tried to tell him to give up on his daughter, we are told that Jesus disregarded them, but if one of them stood in front of Jairus and grabbed him by the shoulders and tried to get him to see reason (“Your child is dead! Give up!”) I think they may have gotten a broken nose. Now consider your struggle against sin. Are you struggling recklessly or, when you first feel the slightest resistance, do you twist a little bit before shrugging your shoulders and giving up, like a bad actor? Our attitude toward temptation should be like a three-year-old’s attitude toward naps: there should be some kicking and screaming involved. “In your struggle against sin you have not yet resisted to the point of shedding blood.” When you have ropes and chains holding you to sin and you want to run to Jesus, you going to have to struggle. You might lose your shirt or some skin. It is going to hurt, but that is okay: that is just the feeling of what is holding you down finally tearing away. It is a cliché that someone will climb a mountain to reach a wise man on the top and ask him, “What is the meaning of life?” We are given the answer to that question in the readings today, and we do not even need to climb any mountains. The meaning of life can be considered in two ways. It is the standard model of life, the explanation for why anyone does anything. What motivates one person to serve the poor, while another person tries to get as much money as they can, while another person jumps out of airplanes for fun? This is the domain of psychologists and sociologists. They have come up with many answers, some simple and some complicated. Is there just one motivation with many different expressions or a hierarchy of needs that are satisfied in turn? But another way to consider the meaning of life is: What should be our motivation? This is the domain of philosophy and theology. This is what St. Paul means today when he says, “When I was a child, I used to talk as a child, think as a child, reason as a child; when I became a man, I put aside childish things.” That is the difference between a child and a grown-up: a child does whatever they want to do, but a grown-up decides what their motivation will be, they choose a meaning for life, and then act accordingly. St. Paul is also telling us what meaning of life we should choose: love. What does it mean to choose love as the meaning of our life? It does not mean to chase a feeling. To chase after romance wherever we can find it is clearly not the profound meaning of life that St. Paul is telling us about. To love on purpose means to see what is beautiful in someone and then to give of ourself for the benefit of the other. This kind of love is why a parent works at a job they hate in order to care for their family. This kind of love is why people choose jobs like teaching that pay much less than other jobs, because they love the children; they see what is beautiful in them and then sacrifice for their benefit. Love is why a person can serve the poor: they see what is beautiful in them and then give of themselves for their benefit. Whether a person feels love or not does not matter, if they have chosen love as the meaning of their life. That is the grown-up thing to do. A person grows up a little when they marry someone and choose to love them for the rest of their life. They grow up a lot more on the day they no longer feel the love but stay anyway and continue loving. Jesus Christ is our example of an adult. He chose love as the meaning of his life and then, no matter what he felt like doing, he acted out of love. When he did not want to die on the Cross, he did anyway because he was an adult, more grown-up than any of us. What he felt like doing did not matter nearly as much as what he intended to do. Jesus Christ is treated badly in the Gospel today. He preaches the Good News and the people try to kill him, yet he goes on preaching. He does not kill all of these people with a wave of his hand, as he surely could have. He loves them, because that is what he meant to do. Today is the Feast of the Presentation. The child Jesus is now 40 days old. This is the last celebration we have of the child Jesus, until we begin again with the Annunciation. In the Jewish law, the presentation signified the end of the pregnancy of Mary, since the official recovery after pregnancy was 40 days for a boy and 80 days for a girl. Today Mary is bringing her sacrifice to the temple: two birds. She was supposed to bring one bird and one lamb, but a poor woman is allowed to bring two birds instead. Here is another sign that our Lord was not ashamed to be poor. The lamb or the first bird was a burnt offering to the Lord. It was not eaten as most sacrifices are. It was burned up entirely. The odor of the burning animal rose with the smoke and the sweet smell made atonement to the Lord for the mother. The second animal, always a bird, was killed with a thumbnail, its blood squeezed out, and then the meat was eaten by the priest’s family. It was an offering for unintentional or unavoidable sin, in this case, touching blood. These sacrifices are bizarre to us, even more so than sacrifices in general. The idea that a woman would need to atone for giving birth or had committed a sin while doing so is strange; we are uncomfortable that such a thing would be required in the Law given to Moses by God. It seems that Luke was also uncomfortable with the idea since he makes no mention of the actual sacrifice. He instead tells us about two people whom Mary and Joseph met on their way in: an old man and an old woman. The old man, Simeon, just runs up and takes Jesus, blessing and praising God. The old woman, Anna, appears, thanks God, and begins telling people about the child. Here Jesus is welcomed by the people Israel in the way that he ought to have been welcomed. All Israel is represented in these two people who were longing for the Messiah. We celebrate today the fulfillment of the Old Testament. This story is very Old Testament: we have the ancient sacrifices and the prophets longing for a Savior, but something is different – the Savior has arrived. All prophecy is fulfilled. All sacrifice is ended. Most of the people do not know yet, but this child is the fulfillment of every prophecy; this child is the sacrifice that takes away all sins. Jesus again uses the image of a seed growing to express to us what our faith is like. When we use similes, we always end up with an image that is insufficient in some way. We say that this is like that, but we know that there are many ways in which this and that are different, but not when Jesus uses similes. When he describes our faith as being like the growing process of plants, we know that he invented the growing process of plants. It would not be going too far to say that when God created the world, he created plants in just such a way that they would serve as a perfect image later on. Thus Jesus is not straining similes to make a point; he is pointing out signs and symbols which he has himself placed throughout the universe. Whenever Jesus point to a part of creation he is saying that he hid the entire Gospel in that creature when he created it. Therefore, when we consider a beautiful image that Jesus sets before us in Scripture, we know that we will never understand it completely, all the way to the end. There is always something more to learn. A doctor of biology or a horticulturalist will know ways in which the analogy of Jesus extends beyond the average person’s knowledge. However, simply because these parables have more meaning than anyone could find, studying only one of them forever, we cannot give up trying to understand them at all. The seed is the Word of God. We are the soil. We must be soft and welcoming to the Word of God so that the seed does not lie on the surface and get stolen away by birds, but we must be equally hard and unwelcoming to the seeds of the Enemy: the weeds of temptation. We must let the Word of God put down roots, breaking through any hard rocks that get in the way. We must welcome the rain of grace that falls down on us so that the seed will grow. One day, the seed will sprout into a great plant and bear fruit. Then, when the holy angels come, harvesting the world, they will collect all the progress we have made in this world, keep only the tiniest part of it, and burn the rest.